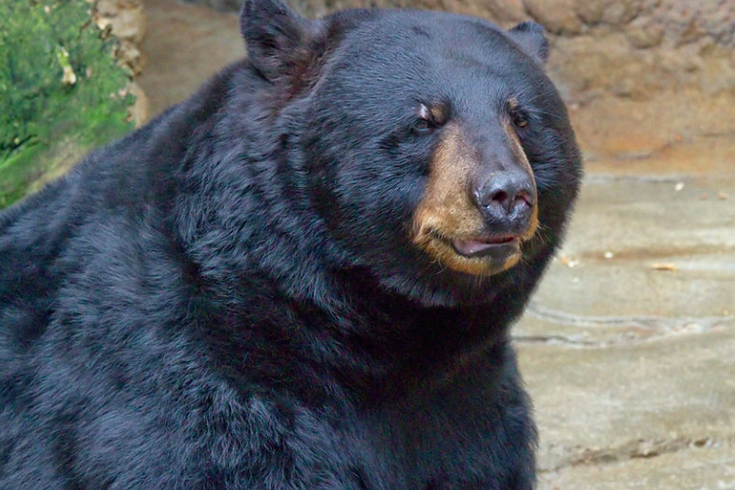 This is a black bear at the Cincinnati Zoo, not the bear we're talking about here. It's a totally different bear. If we have learned anything through two years of Daniel Craig's scintillating #BearWatch series, an obsession he seems to share with other internet scavengers, it's that there are a lot of bears in Pennsylvania. Lot of bears. Their numbers are growing, too. In the official #BearWatch2017 preview, Dustin Stoner of the Pennsylvania Game Commission's southeastern offices explained that the region is seeing more and more bears come around as they seek new territories to mate and eat. There are about 20,000 black bears in Pennsylvania, according to the Game Commission, and considering the woodsy terrain that skirts the state's towns and cities, it's little surprise that we see these bears fairly often. We just don't see them like this all the time. Talk about a monster. This guy was spotted up in northeastern Pennsylvania's Lackawanna County. The average size of an adult male black bear is about 4.5 feet and 240 pounds. It's hard to tell from a photo, but this bear looks to be at least that size if not bigger. He's also approaching a place where people may have passed that moment completely unaware of his stealthy presence. A call to the Game Commission inquiring about the bear was not immediately returned on Good Friday. An administrator for The Valley's Facebook page was also unable to confirm the source of the photo without looking further into the matter. This has been the unofficial #BearWatch2018 preview.